My Cranberry Pine Nut Biscotti are crispy, lightly sweetened and studded with nutritious ingredients like cranberries and pine nuts- they’re perfect for the holidays! Do you love indulging in homemade cookies during the holiday season? It’s often difficult to find cookies that are nutritious and not packed with packed with butter and sugar. 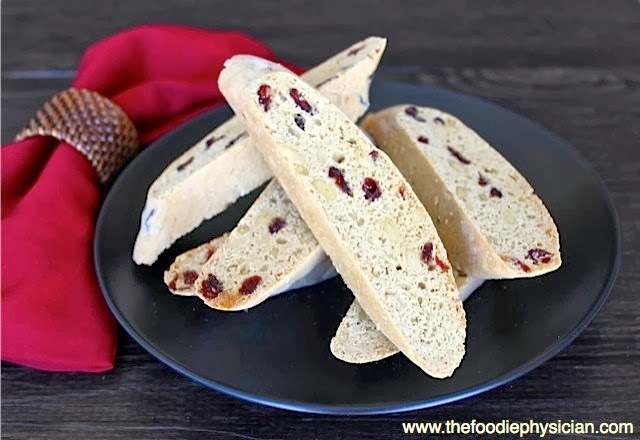 Traditional biscotti, however, are a naturally healthy dessert compared to most cookies because they’re lightly sweetened and they don’t contain any fat in the form of butter or oil. In fact, the moisture comes solely from eggs. Some American versions of biscotti do use butter in the dough to produce a more tender cookie. However, my recipe for Cranberry Pine Nut Biscotti sticks with tradition, which makes it a much healthier option. Biscotti are traditional Italian cookies that are baked twice to make them dry and crispy. The word biscotti is derived from “bis” meaning “twice” in Italian and “cotto” meaning baked or cooked. 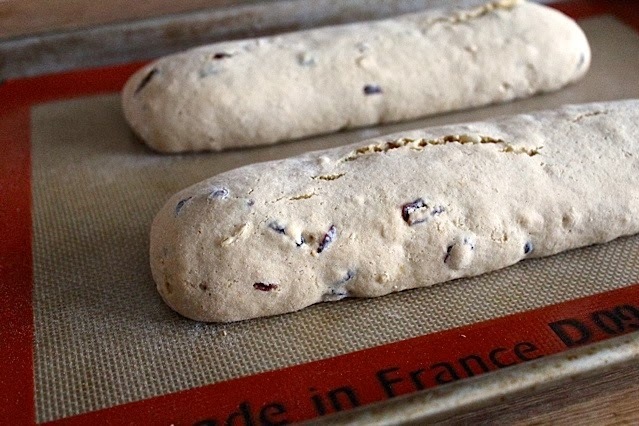 To make biscotti, the dough is typically shaped into a log and baked. Then the cooked dough is sliced diagonally into cookies and baked a second time to produce a crispy, hard texture. 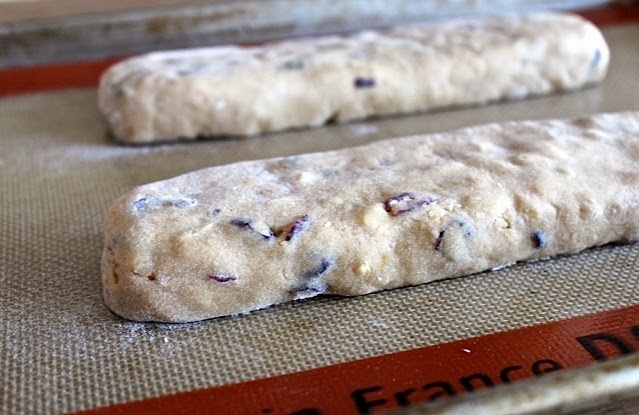 The process of baking twice draws out any moisture, giving the biscotti a long shelf life. Because of their good storage ability, when they were created many centuries ago, they were a common staple for sailors and soldiers who were often away for months at a time. 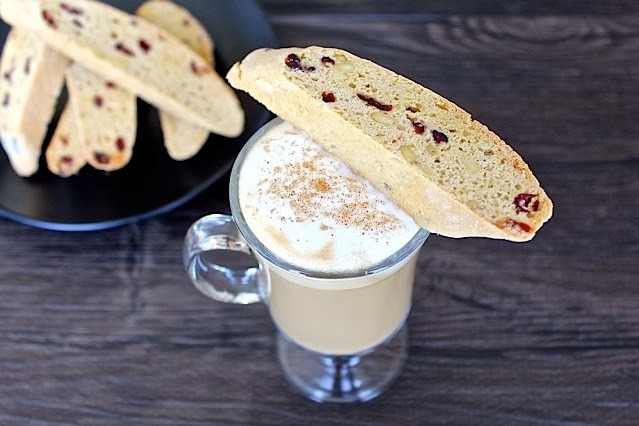 In Italy, biscotti are traditionally served after dinner with vin santo, a sweet dessert wine, but they are also commonly served with cappuccinos and other coffee drinks. Their long shape makes them ideal for dunking. 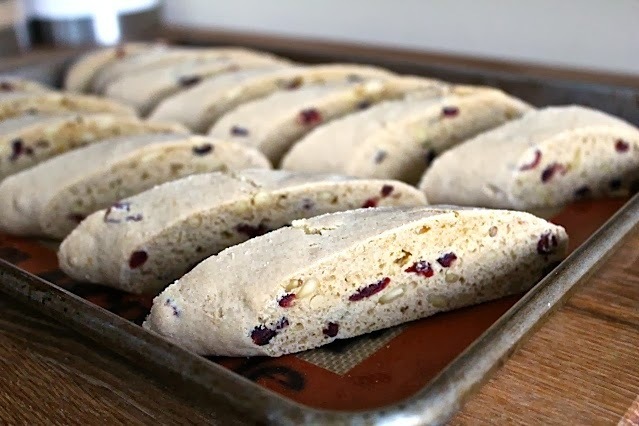 My Cranberry Pine Nut Biscotti are crispy, lightly sweetened and studded with nutritious ingredients like cranberries and pine nuts. To incorporate whole grains into the recipe, I use a 50:50 mix of white whole wheat flour and all-purpose flour. White whole wheat flour has all of the nutritional benefits of whole wheat flour but with a more delicate texture that’s perfect for baked goods. I also like to add a bit of orange zest to the dough as it nicely complements the other flavors. So this holiday season, go ahead and enjoy one or two of my delicious biscotti. You can satisfy your sweet tooth without any of the guilt. Happy Holidays! My Cranberry Pine Nut Biscotti are crispy, lightly sweetened and studded with nutritious ingredients like cranberries and pine nuts- they're perfect for the holidays! Whisk the flours, baking powder, and salt together in a large bowl. Stir in the pine nuts and dried cranberries until well combined. 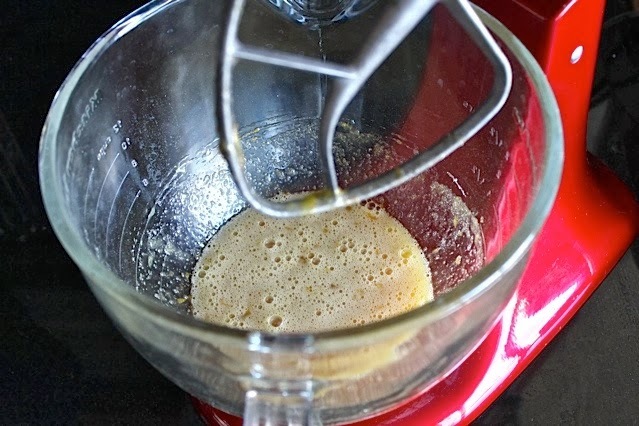 Place the eggs, sugars, vanilla and orange zest in the bowl of a stand mixer and beat with the paddle attachment until well incorporated. 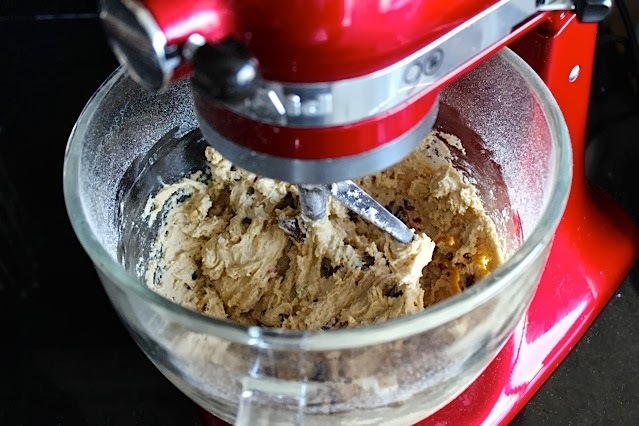 Add the dry ingredients and continue to mix until a stiff dough forms. Divide the dough in half and place the balls of dough on a cutting board dusted lightly with flour. Roll each ball out into a log roughly 9 inches long by 2 inches wide. Place them on a baking sheet lined with a nonstick silicone baking mat or parchment paper. Press down on the top of the logs to flatten them slightly. Bake 28-30 minutes until firm to the touch. As they cook, the logs will spread out slightly. Remove from the oven and cool on a wire rack for 10 minutes. Transfer the logs to a cutting board and using a serrated knife, cut them on a diagonal into ¾-inch thick slices. 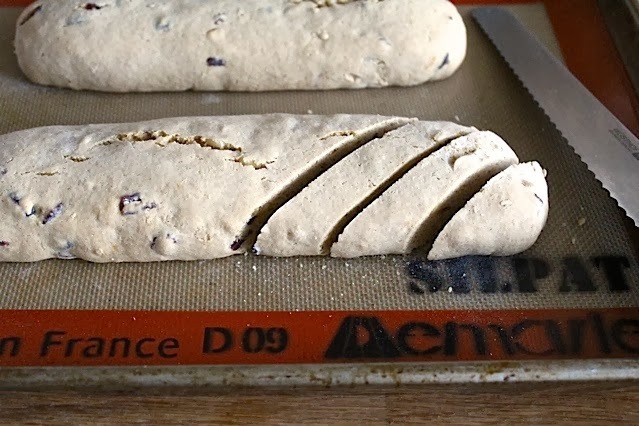 Arrange the slices upright on the baking sheet and place it back in the oven. Bake an additional 15-20 minutes (cook longer for extra crispy biscotti). Remove from the oven and cool on a wire rack before serving. It has more proteins than the other 🙂 Lovely make thanks you for this share. the biscuit looks crusty.